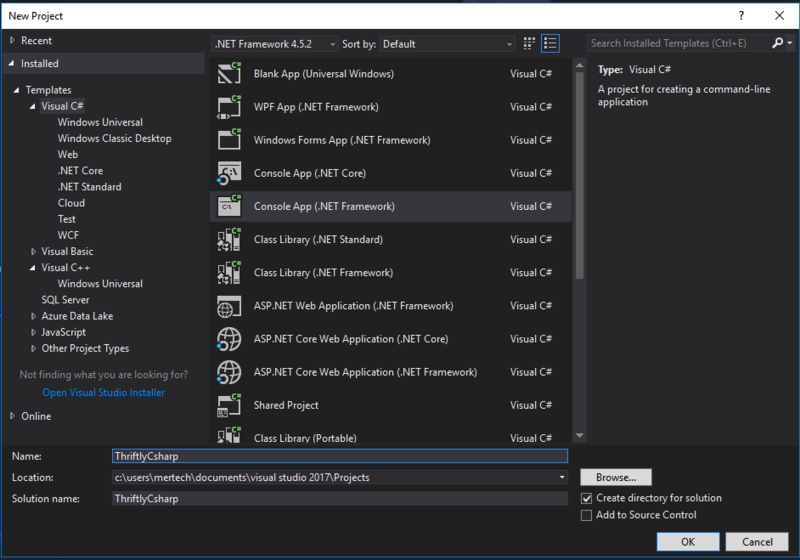 Thriftly provides a sophisticated platform designed to help you build, test, and publish a .NET web API that simultaneously handles multiple protocols. Your .NET API will support any client that can make calls in SOAP, REST, JSON-RPC, Thrift Binary or Thrift Compact through HTTP or TCP/IP socket transports without any changes to the existing codebase. 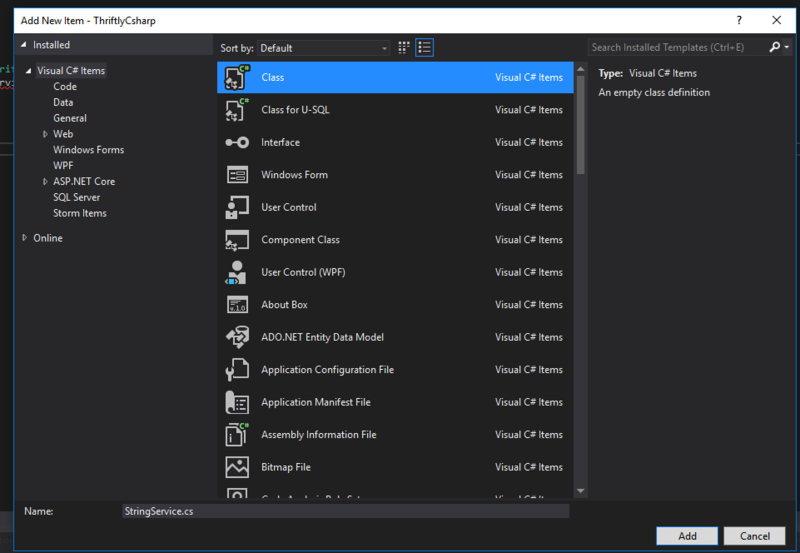 All you need to do is write your C# function, and Thriftly will handle the rest. No need to dive deep into another .NET web framework ever again. Thriftly also has built-in support for Microsoft’s Azure API Management to add additional features to your Thriftly API! We will be building a Thriftly C# Web API that manipulates strings. You can also watch a video of this C# Thriftly API tutorial by Paul Royer. Before we get started with Thriftly, you will need to create a Thriftly.io account, download the development version and request a trial license. If you haven’t installed Thriftly, follow the Installing Thriftly Developer [Guide] to register your license in Developer Assistant. If you would still like to see more examples, please review the .NET Sample application guide after this tutorial. Please make sure you are running Visual Studio 2010 or later. 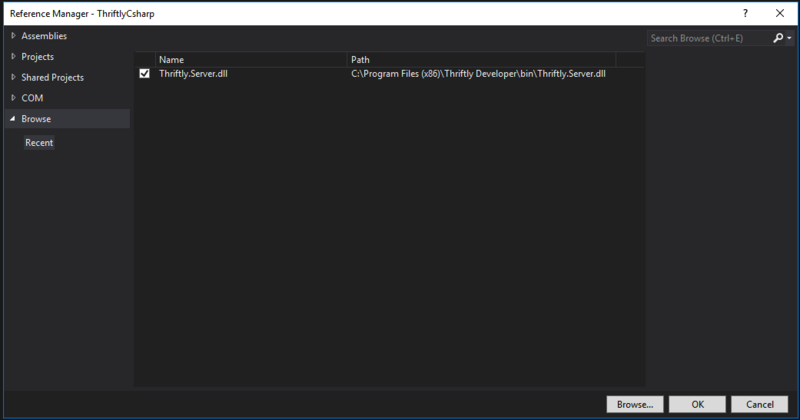 Select File ‣ New ‣ Project ‣ Windows ‣ .NET Console Application, and then click OK.
Now that we have our project established and a reference to the Thriftly DLL, we will need to initialize the Thriftly Server object in the main program.cs class. The Thriftly Server object organizes your API classes as services. In the following code sample, you will see a basic skeleton to initialize a Thriftly Server and add services. The StringService() object is where our API logic lives, and we are adding that class to be published by Thriftly. Later you will see how Thriftly can publish the API privately or publicly. Now that we have setup the Thriftly Server, we are ready to define our service class. Add the new service class to the project by following these steps. Select Project ‣ Add Class ‣ Visual C# Class. Save the file as StringService.cs, then click Add. We will modify the auto-generated class template to what is shown below. The StringService class uses the reference to Thriftly Server to allow us to use the [Publish] annotation that appears above the Join and ToUpper function, which tells the Thriftly Server that we want to publish these functions as APIs. At this point, we have a very primitive string API service that has two published functions. The Join function takes two parameters and returns the concatenation after a bit of error handling. The second published API function, ToUpper, takes a string and converts it to uppercase. We can start the Thriftly Service by clicking the Start button or by pressing F5. The Thriftly Developer window will appear once your service has started. Here you can choose the transport method, the default protocol, and encoding that meet your needs. You can change any of the settings by stopping Thriftly. We will start Thriftly with the gateway enabled, so after clicking the 'Enable Gateway' option, select the region closest to your location for better performance. The available region gateways work as a proxy to the API running locally on your machine. We will continue with the default JSON-RPC through HTTP as our settings. When you click the 'Start Thriftly' button, your default web browser will automatically appear with the Gateway Address loaded. The Gateway Address is the API specifications that can be shared with a developer. In order to test the API, copy the ‘Location’ URL in a new tab or follow the ‘Test API’ link to the Gateway Endpoint URL. This public URL will allow clients to access the API running locally on your machine from anywhere. No network configurations or code changes required! If you start Thriftly without a Gateway enabled, the Thriftly API will only be accessible through your chosen port on your localhost. When you follow the 'Test API' link, you will be taken to a custom APEye interface that provides a simple GUI for testing your published API functions. Since we started the Thriftly Developer in JSON-RPC, the APEye interface will automatically load a request and response interface through JSON-RPC. Read the Testing Your Thriftly Application guide for more information. Thriftly allows you to focus on the thing that matters, your business logic. When using the Thriftly Gateway, there is no need to worry about firewall or network settings when publishing your API. You can put your mind at ease that your application will simultaneously handle the most trusted protocols without any additional code changes. When you are happy with the way your API is running, the next step is to deploy the API to production by setting up the full Thriftly Deployment Server on a dedicated machine.